Indo-French outfit Sherco TVS won the second stage of the Merzouga Rally, with Michael Metge topping the times on Tuesday. Both Sherco TVS and Hero MotoSports teams secured a top five finish as the first stage of the Merzouga Rally finished on Monday. 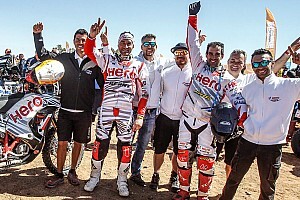 Hero MotoSports Team’s Merzouga Rally campaign got off to a stellar start on Sunday, with both riders Joaquim Rodrigues and Oriol Mena finishing inside the top 10. Factory TVS rider Aishwarya Pissay will compete in the second round of FIM Bajas World Cup in Portugal this weekend. Factory TVS Racing rider Aishwarya Pissay will kick off her 2019 rally campaign with the Dubai International Baja in March. Alexander Rossi has been involved in an incredible near-miss while competing in the Baja 1000. Indian cross-country rally rider Abdul Wahid Tanveer put on an impressive performance in the Rally of Morocco, finishing second in the Enduro category for Sherco TVS. Sherco TVS will field Indian riders Abdul Wahid Tanveer and Harith Noah in the upcoming Morocco cross-country rally. CS Santosh finished as the top Hero MotoSports rider as the Peru Desafio Inca Rally concluded on Sunday. Sherco TVS recorded its second win in the annual PanAfrica rally, with Michael Metge claiming the top spot for the Indo-French outfit.